Stride by Stride: Me--Aaron Eckhart’s Contractor! Dumbledore told me my dreams could be anything I wanted them to be. Naturally, in my sleep state I became Aaron Eckhart’s carpenter. No, I know nothing about building a house, cutting its framework or securing those frames to the concrete floor with what tools and materials? Still the idea of answering to Aaron Eckhart should I mess up his home and the walls fall down, definitely appealed to me. My sister was the boss of me in this dream, as well. Not something that I’m comfortable with in real life or my dream state. Need to ask Dumbledore to clarify what that was all about before allowing myself to fall asleep tonight. Should he refuse to give me a good answer, I’ve already decided to ask Harry Potter to suit me up with some sort of spell to send her off. Me and Aaron Eckhart alone? Sounds awesome. Me, my pretty sister and Aaron? No thanks. She’ll just muddle up my chances to woo him. To construct properly, or do whatever it is that contract carpenters do to impress the person she’s constructing for. 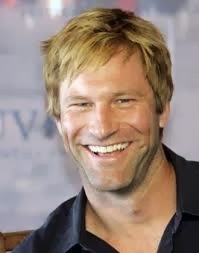 Building Aaron Eckhart a safe, comfortable home wherein he’s forever indebted to me for his quiet sanctuary and cozy environment will be number one on my dream list request when I fall asleep tonight. Now if only there was a way to make what occurs in my dream state, happen in real life.